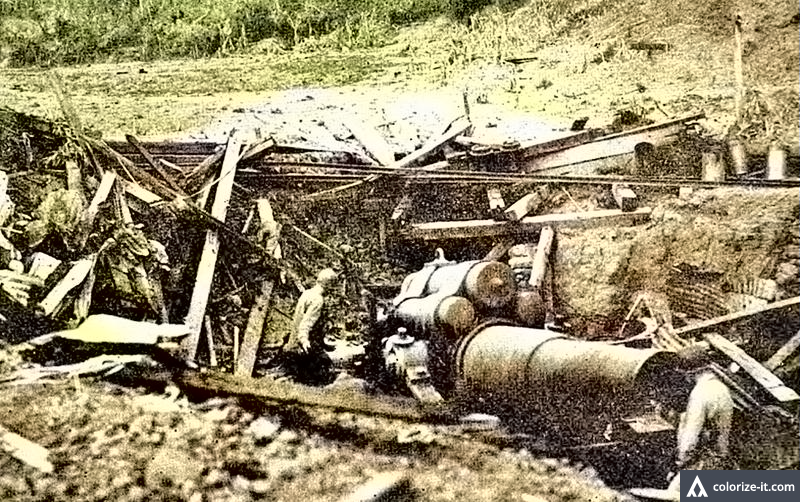 Captured Japanese artillery on Mt. Maculot, 1945. Considered among the fiercest battles fought between United States and Japanese forces in the Western Pacific Theater of War was that fought in Mount Maculot – or Mount Macolod as many American war documentation referred to the mountain. In fact, the two-pronged pincer strike of US Army troops from Nasugbu through Tanauan and Santo Tomas in the north and Batangas town from the southwest had already closed in Lipa late in March 1945 before the Americans returned to Mount Maculot to try to finally subdue the Japanese defenses. The pictures shown in this post were taken from the battles that ensued. American armor and soldiers in the Battle of Mt. Maculot, 1945. Both pictures have been processed using graphics editing software to improve clarity and then colorized courtesy of Algorithmia.